US-285 experiences heavier eastbound traffic on Sunday evenings in the summer and there can be some delays until you hit the 4-lane part at Conifer, so expeditions are best on weekdays or on Saturdays. It is 39 miles from the C470 and US-285 intersection. On Highway 285 go to Bailey. Turn left opposite the Conoco Station and cross the creek. Go past the front of the Moore Lumber store 200 or 300 yards. Just past the small church on the left there is a Y intersection. Take the left hand fork onto the gravel road. Go approximately 1 or 2 miles on the gravel road to where you see the trailhead sign pictured above. Do not turn in at that sign because the parking area is too small and often crowded for horse trailers. Drive on about 300 yards and turn right onto the dirt road. Start looking for parking along the dirt road, recognizing that about 200 yards from where you turned off, there is another intersection where you can turn your rig around. We have traditionally parked on the meadow north of the road, as indicated in the picture. However in the summer of 2016 the road side ditches were scraped out much deeper and parking is limited to the shoulder of the dirt roads. Payne Creek Trail 637 north. 14 miles round trip to Craig Creek valley to the south. There are a few sections with small loose rocks and three short, steep sections, but the trail is no problem for horses. Early summer trail. Brookside McCurdy 607 north. 13 miles round trip to Craig Park. There are about 2 miles of not-very-steep trail with small loose rocks. High summer trail as the high point is about 11,300 feet and the last 1.5 miles are heavily wooded northern exposure. 48 miles from the C470 and US-285 intersection. Traveling on Highway 285 to Bailey turn southeast on Wellington Lake Rd (County Road 68). Follow it for about 3 miles to a fork and take the right fork going another mile or so passing CR860 coming in from the left. Look for the trailhead on the right. Go past the trailhead to Windy Peak Outdoor Lab to turn around in parking lot. Return from the lab area and park alongside CR68 just before the trailhead. Parking at the trailhead is limited and while there are two possible lots, the upper one will not accommodate a truck and trailer! Colorado Trail 1776, Segment 4. 18 miles round trip to the North Fork trailhead. Most of the trail is on the abandoned Hooper Pass Toll Road. Slopes are gentle and there is little loose rock on the trail. The most distant part can be cleared from Lost Park or from this trailhead. Early summer trail. Payne Creek 637 south. 12 miles round trip to the place where the trail leaves Craig Creek valley. The first 4 miles is on the Colorado Trail. The next mile descends to the bottom of the Craig Creek Valley. The last mile is along the bottom of the Craig Creek Valley, designated as Craig Meadows on maps. On the south side of Craig Creek next to the trail crossing is a fine place to camp with your horses. 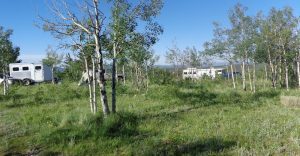 Level sites, good grass, lots of firewood and good trees for highlines, all more than 100 feet from the creek and the trail. Early summer ride. Rolling Creek Trail 663 to Wigwam Park. The first 1.5 miles is fairly level and is an easy ride. Beyond that, the trail goes into a narrow gully with slanting bedrock, making it extremely dangerous or impossible for horses. 39 miles from the intersection of C470 and US-285. Proceed SW on US-285 past Pine Junction to the next traffic light, about 4 miles. As you approach, there is a big sign “Dynamic Properties” on the left. You will see a gas station on the right (north). Turn right (north) at the traffic light onto CR43 (Deer Creek Road). Proceed 6.8 miles to a point where there are about 40 mailboxes on the right side. Proceed straight on the blacktop and up the hill on CR47 (GPS 39.499167, 105.531648). Go for 1.3 miles past the Meridian Campground. The next left will be into a large graveled area from which two gravel roads diverge. There will be a Meridian Trailhead sign on the left-hand road. Proceed up that road for about one mile. The road is in good condition but quite narrow and bounded by trees on all sides. As you approach the trailhead and can just barely see it ahead, you will see a gently sloping open meadow on the right. You can park in that meadow. The trailhead itself is quite small and if any cars are parked there, it would be tough to turn around there. If there are no other cars, you can turn around and position your rig in the trailhead parking but no more than two rigs. If you park in the meadow, it is possible to turn around without backing up. Meridian Trail 604. 7 miles round-trip to the divide where it terminates in the Cub Creek trail 40. This is the almost ideal trail, not especially steep and with a soft trail surface consisting of rotten granite soil. Early summer trail. Connects with Cub Creek trail 40 segment between Indian Creek trail 41 and Meridian trail 604. 2 miles one-way. Often we clear this section when we clear the Indian Creek trail. Early summer trail. Connects with Cub Creek trail 40 segment between the Meridian trail 604 and the Lost Creek trail 42. 3 miles one-way. Includes both trail with small rocks and stepping over boulders, but a good mountain horse can handle it. High summer trail. Proceed SW on US-285 past the traffic light at Pine Junction. Several miles down the road, turn right at the traffic light. You will see a gas station on the right (north). Proceed 6.8 miles to a point where there are about 40 mailboxes on the right side. Take the left hand fork which is paved. Proceed up that road past the campground (where the road turns to gravel) to the big wide open trailhead parking lot. Rosalie Trail 603 east. 11 miles round-trip to the intersection with the Three Mile Creek trail on the divide. There are small loose rocks on the trail in some sections, but there is no bog and no steep places. High summer trail. Tanglewood Trail 636. 8 miles round-trip to timberline. After the first half mile, this trail has a persistent moderate grade with only a few short quite steep sections. For about 2 ½ miles, the trail has lots of small rocks, so a well-shod horse is a requirement. High summer trail. Three Mile Creek Trailhead. 34 miles from the intersection of C470 and US-285. This has been a vestige of a trailhead where up to 6 automobiles may park. Or if there are no autos present, two rigs can park bumper to bumper. The Forest Service evidently has plans for parking on the other side of the creek and access via a short trail and a bridge over Geneva Creek, but this is not ready in 2017. Threemile Creek trail 635. 12 miles round trip to the intersection with the Rosalie Trail. Involves between 12 and 18 crossings of a creek about 2 feet wide and 5 inches deep, so do not attempt with a horse that will not cross water. The trail surface is generally good, although there are sections with small rocks. 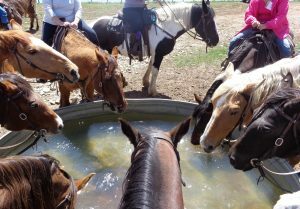 The local dude ranch has kept this cleared for their riders, although not necessarily to our standards. For this reason and the parking problem, we have not cleared this trail since 2006. High summer trail. 38 miles from the intersection of C470 and US-285. When you get to Grant, turn right (north) on County Road 62 and proceed toward Guanella Pass for a bit less than 6.8 miles. The paved parking area is laid out for car parking and is delineated by curbing, so a rig is going to have to park across a number of automobile slots if they are vacant. If it is crowded, likely some person will park immediately in front of your pickup truck while you are gone, blocking you in. As of early 2016, there is room for a rig or two on the left shoulder about 150 yards SE of the trailhead parking. For now, if you expect to park, it is better to plan on going on a weekday in the summer or wait until September. Abyss Lake Trail 602. 7 miles round trip to the intersection with Rosalie Trail 603. This includes 2 miles of trail with small rocks and a 500 yard interval of stepping up over sizable boulders. The section below the Rosalie Trail seldom has much in the way of deadfalls. The next two miles on 602 or east on 603 involves some steep and rocky sections and may have a fair number of deadfalls. This section of 602 also has boggy portions. High summer trail. Burning Bear Trail 601. This is not a wilderness trail and is fairly low in elevation. We do not generally clear this trail. Early summer trail if the sometimes boggy section near the parking place is not too soft. 43 miles from the intersection of C470 and US-285. This is basically just a shoulder off the road. If you are west bound and want to park a rig, you should proceed past the trailhead and past the first pull-out on the right to the second pull-out on the right just short of the Santa Maria camp entrance. Turn around there and come back, parking on the right side of the road. It is not particularly safe. Visibility of east-bound traffic is good, but they don’t slow down. Ben Tyler Trail north 606. 10 miles round trip to the intersection with the Craig Park trail 608 at the top of the ridge. The first mile is level and easy going. The next two or three miles follows a washed-out old logging road, with many protruding pieces of bedrock and some smaller loose rocks. These are conditions that are more likely than average for “peeling” a horseshoe if the horn of the shoe gets caught on a rock. Some sections are steep. 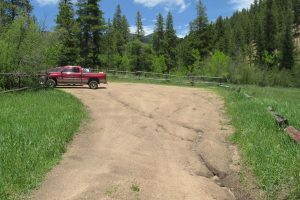 While a properly shod mountain horse should have no problem with this trail, several FRBCH riders have declared that they will not ride it a second time. 65 miles from the intersection of C470 and US-285 via the Lost Park Road. Or 73 miles via Jefferson, Route 77, and Rock Creek Hills Road. The first 1.5 miles of the Lost Park road (county maintained) seems to consist entirely of large cobblestones and is generally traversed at 10 to 15 mph. It tends to be hard on trailer suspension. The remainder of the Lost Park Road to Rock Creek generally has a good deal of washboard after mid-June. The first half of the longer route via Jefferson is on paved Highway 77 and has a low speed limit. The Rock Creek Hills road is all-weather gravel and does not seem to have as much washboard as the Lost Park Road. 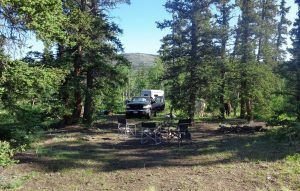 The Rock Creek trailhead has good dispersed campsites for equestrians with good places for highlines and some protection from the wind and sun. 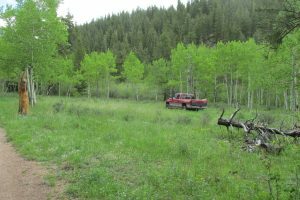 The equestrian campsites are just short of the parking for the Colorado trail along the edge of the timber. They can accommodate up to 9 rigs, with more possible on the level prairie adjacent. GPS to the camping area in these pictures: 39.360768, -105.68047. Ben Tyler Trail south 606. It is 9 miles round-trip from the trailhead parking to the intersection with the Craig Park Trail 608 on top of the ridge. There is some rocky trail and a little bog about 1.5 miles from the trailhead, but the rest is an easy trail. The last part is across a level, dry willow flat where the trail is marked by a few posts, since there is no worn trail. The trail is easy enough to find northbound on the willow flat, but connecting going back can be tricky if you don’t have your northbound track on your GPS unit. Colorado Trail 1776, Segment 5. This trailhead puts you in the middle of the 14 mile Segment 5. FRBCH does not generally ride this trail as it is maintained by others.